The Amherst Biennial spreads from the little White House at the entrance at Hampshire College in South Amherst (Matt Johnson's sculpture will be installed by the Admission Office this week) to the Harp with Lynn Peterfreund's video (starting at 8 PM) for the after party! The majority of the exhibits will be open this evening, the exceptions are: The Eric Carle Museum, The Jones Library, Hitchcock Center and Amherst Town Hall. Also, The Lord Jeffrey Inn is hosting weddings but you can still see Dawn Siebel's paintings at the Tavern entrance and William Brayton's sculpture on it's front lawn. All four of these venues will be hosting receptions during the November 1st Artswalk, Eric Carle museum will be free to the general public and will be hosting reception with the other Biennial sites on Thursday, Nov. 1. The weather may affect Samuel's Rowlett's performance this evening. But as of this time, it's a go. Samuel's performance begins at 5 PM at the Pond behind the Fine Arts Center at UMass. Karen Dolmanisth's performance is scheduled at Stearns Steeple in the quad in front of the Mead Art Museum at noon tomorrow Oct. 7th. Rain brings the performance inside the Mead Museum. Several more performances on weekends will post link and dates soon. Look forward to seeing you all tonight! 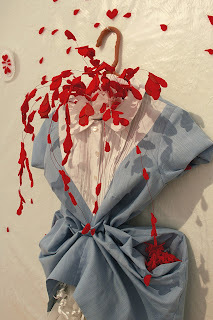 Alicia has a wonderful installation also at Boltwood Gallery of "Repeat" a mixed media sculpture of a "family heirloom", a victorian chair which she has enlivened with fabric cascading to the floor echoing the falling leaves outside the window of the gallery.